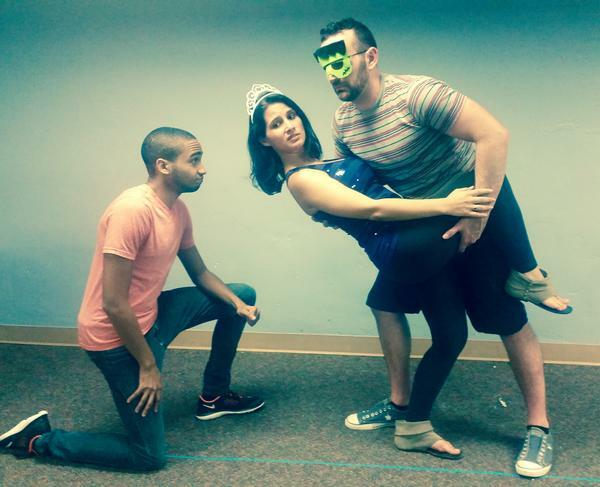 Actors Stephen Ruffin, Blanca Aguero and Jayme Smith rehearse for "A Night of Twisted Tales." From the TV series “Once Upon a Time” to Eddie Murphy as an enchanted donkey in “Shrek,” it’s a popular phenomenon to put fairy tales in a modern context. The plays, all by female playwrights, range from known and unknown fairy tales. One is based on “The Peasant’s Wise Daughter,” where a young women is constantly thwarted but solves riddles and gives good advice. Other plays include characters like Little Red Riding Hood, who faces not a wolf but a woman putting other women down to feel good about herself. Then, Maleficent and Aurora from “Sleeping Beauty” wear the same gown to an awards show. The princess from “The Princess and the Pea” is featured in two plays. In one, she can’t sleep without her iPhone, which she had dropped in a puddle. “A Night of Twisted Tales” finishes its run Friday and Saturday at the Aurora Theatre in Gwinnett County.